A slender-stemmed, erect herb, 1 to 3 feet high from a perennial root. Stems downy, puberulent or hairy, usually several from a root. Leaves puberulent or smooth; the pedicels, calyx and corolla pubescent. Leaf blades denticulate, the lower ones oblong or ovate, somewhat obtuse at the apex; petioled, 2 to 41/2 inches long, one-half to 2 inches wide; upper leaves smaller, lanceolate, long pointed, sessile or clasping the stem. 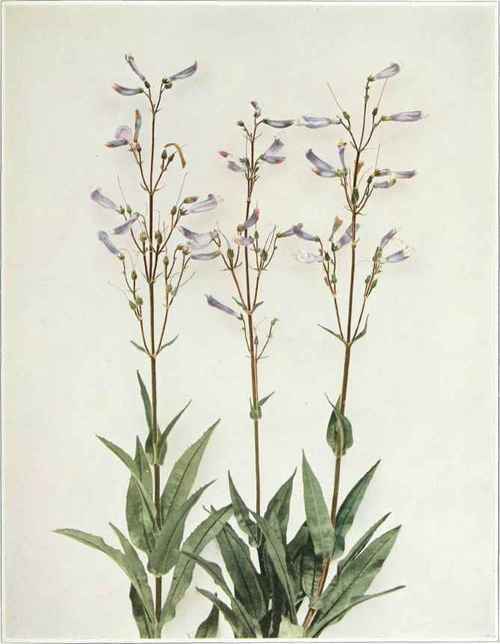 Flowers borne on short pedicels in a loose thyrse, purplish or violet in color. Calyx five-parted, the lobes overlapping; corolla consisting of an elongated tube about 1 inch long, dilated at the point of separation of the upper and lower lips; upper lip two-lobed; lower lip three-lobed; throat of the tube nearly closed by a hairy palate. Stamens five, four of which are anther-bearing, the fifth sterile and densely bearded for about one-half its length. Dry woods, thickets and fields, Maine to Ontario and Minnesota, south to Florida, Alabama and Missouri. Flowering in May, June and July.